Today, Parliament released the “Culture” select committee’s report “Supporting the Creative Industries”. The headline pursued by most media outlets is that Google’s efforts to limit copyright infringement by its ‘users’ is, to quote the committee chairman, John Whittingdale, “derisory”. This is reported by Computing, which extends Whittingdale’s quotes which demand further action from Google which is erroneously singled out as the single largest source of piracy and thus the single largest source of damage to Britain’s creative industries. Peter Bradwell of the ORG, and Paul Bernal of UEA cover the report and its impact, in Peter’s case on the ORG Blog, in an article called, Culture Committee copyright report one-sided and simplistic and in Paul’s case on his blog in an article called, Supporting the creative economy?. The ORG verbal evidence to the committee is available as a video here…, on Parliament TV. Enjoy the show and Peter’s persistant return to statistics and factsEnjoy the ride. Bradwell covers the issues of online privacy, which the committee sees as an inhibitor to business, and mentions the committee’s shill like repetition of criticisms of the Hargreaves’ Review and its consequent reforms, which involves the creation of a number of copyright exceptions. This select committee challenges the proposal that the Hargreaves inspired reforms will increase the wealth creating capability of the nation, and Peter quotes more independent sources that back up the view that the Hargreaves reforms are proportionate and modest. Bradwell also compares the DCMS views with those of the BIS select committee who also take a more positive position with respect to the Hargreaves proposals. [provide] for the first time in the UK, independent scrutiny of proposed regulatory measures put forward by Government. ‘Robust evidence-based policy’ seems to basically have come to mean ‘evidence I agree with and which helps support the conclusions I have already arrived at’. Probably best to leave it there, but for those of us following this debate, Bradewell’s conclusion that no-one is really interested in facts and evidence is pretty compelling from the behaviour of the copyright maximalists and their supporters. Also when considering three stikes or graduated response, we must consider the French experience, reported at Techdirt, where only one person has been convicted and their penalty has now been lifted and Techdirt’s article on Rebecca Giblin’s research on the ineffectiveness of graduated response. Bernel’s blog explores the proposition that the DCMS committee report sees Google as the enemy. It is my view that while this policy issue is seen as Google vs. Hollywood and Nashville, there will never be an answer in the interests of the public as a whole. Google and the other social networks want to infringe our privacy, as do the copyright maximalists, who also want to infringe our freedom of speech & rights to a fair trial. Politicians should be looking for an answer in the interests of us all. Is this the beginning of a donors vs. voters political weighting. Who does copyright work for? He also explores the question, “Is copyright working?”. He raises the issue of consent. I suggest that while, as in the UK, copyright offers an exclusive, indefinite right to monetise (other people’s) content, popular consent to the law will be withheld and laws like the DE Act will merely criminalise the mass of music and movie fans. What few policy makers and lobbyists seem to understand is that Piracy has a supply chain, at one end there the industrial infringers and at the other end there are fans. While you seek to criminlaise and punish the fans, you will fail at business and fail to win consent to actually prosecute the industrial scale, commercial infringers. Paul picks up the attack on the Hargreaves proposals. This may be the most important part of the report as far as Industrial Content are concerned and reflects the comments made at the British Music event at Labour’s conference that we need no more reviews of intellectual property laws. Paul also questions if stronger anti-piracy laws are actually any use and compares the committee’s identification of the technology industry’s agenda without recognising the mirror impact of the music and film industries agenda. 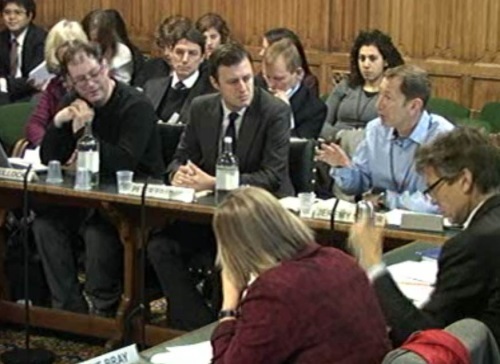 I think we can assume that the DCMS select committee has been captured by the Industrial Content lobby. If you want my take on Hargreaves then check out this article on my blog, “Censoring the Internet”, in which I point at Jeff Lynn’s article on the ORG site, called “Hargreaves, a great set of ideas….”.